EZSurv® is a GNSS Post-Processing software that provides reliable and efficient RTK offline solution to improve the accuracy of your survey or GIS mapping data. With EZSurv, you can also access automatically 10,000 base stations. 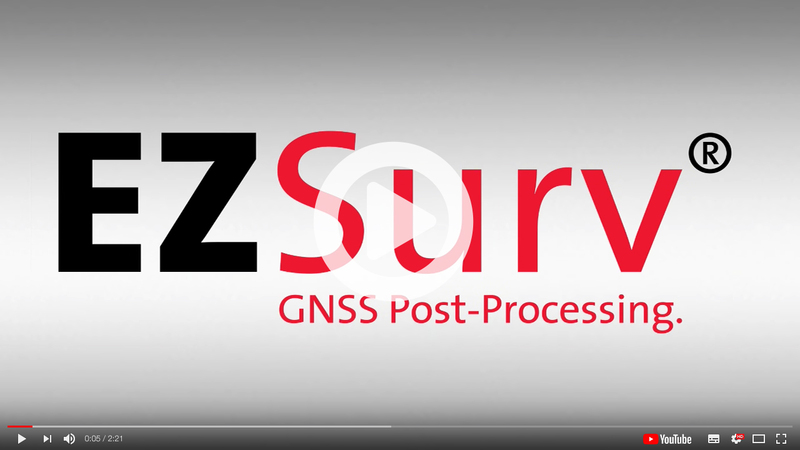 EZSurv is a reliable and effortless solution that allows seamless data post-processing between different GNSS receiver native formats. This real value-added step can be easily integrated into your current RTK process or your GIS mapping data integration loop. EZSurv is an open solution that processes GPS, GLONASS, Galileo and BeiDou signals from different types of receiver brands. It is compatible with industry standard data collection software. EZSurv calculates drone in-flight positions through GNSS observations for a precise interpolation of each shot. Captured images can be calculated at +/- 1cm. For each in-flight image, the center perspective’s geographic position may be used to perfectly integrate data images into the user’s reference system. Once the drones are in flight, the quality GPS receivers they are equipped with record the GNSS observations at a high data rate (+/- 10 to 20 measures per second). Whenever an image is captured, the exact view time is also recorded for interpolation purpose. With EZSurv, high accuracy post-processing results are generated at a single key stroke, at a fraction of the cost of a dual GNSS frequency system. EZSurv is the most reliable post-processing software currently on the market to deliver centimeter accuracy positions using roving single frequency GNSS receivers (OTF L1). As in RTK mode, EZSurv can either use your own base station data or automatically connect to different base station providers. This flexibility allows you to retrieve the closest base station data required to compute accurate rovers’ positions in post-mission. EZSurv can also generate OminiStar/WADGPS/StarFire equivalent point positioning accuracy (Precise Point Positioning) by using post-mission precise orbit and clock data calculated by different international agencies. EZSurv is available in different versions depending on your receiver type (single/dual frequency) and the accuracy level that you require. EZSurv can be licensed using a receiver Serial Number. This allows you to install the software on as many PCs as you want to process data from registered receivers (in native binary format). It can also be licensed on single PC using a software keycode. This allows you to process multiple datasets from different receivers on a single PC (although you can easily move the License on different PC). We have a PC-RINEX License (limited to RINEX format) as well as a PC-OPEN License to read any native raw data format.